Never Miss The Perfect Commercial Property OR Home Again! 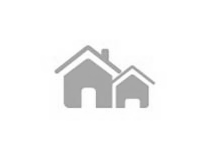 Note: Our home search form lets you create and save multiple Commercial Property OR Home Search profiles. You may update these profiles or cancel at anytime.
" YOUR ONE STOP SHOP FOR ALL YOUR REAL ESTATE & MORTGAGE/LOAN NEEDS!!! " 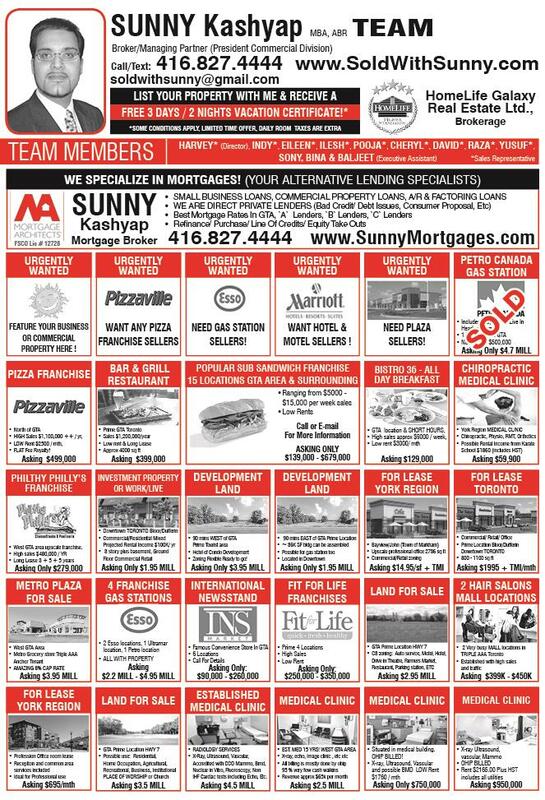 MORTGAGE ARCHITECTS , Brokerage, your source for Toronto real estate and THE BEST MORTGAGE RATES AND COMMERCIAL LOANS!!! If you own real estate that you're thinking of selling, Our TEAM would be happy to provide you with a FREE Property Evaluation. 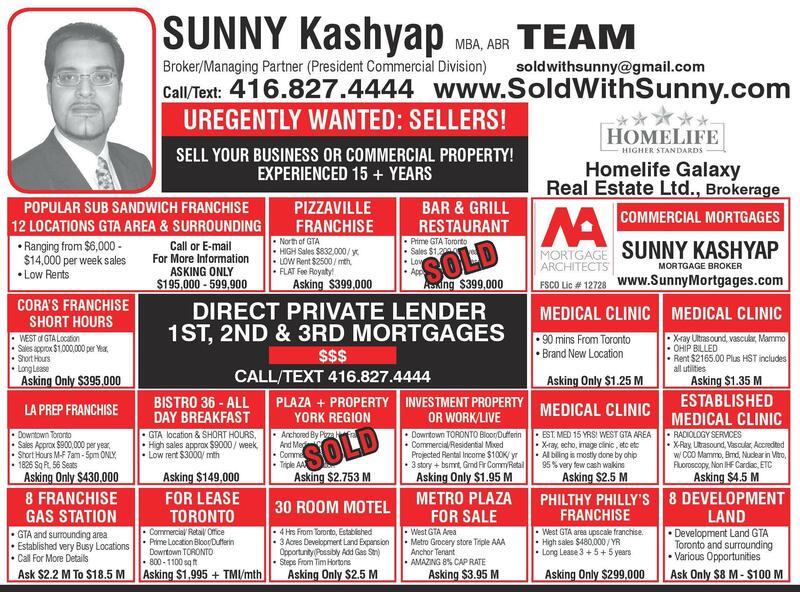 Toronto with my New Listings Notification. Whether you are BUYING or SELLING a HOME or BUSINESS or COMMERCIAL PROPERTY or INVESTMENT Property, Looking for a MORTGAGE or COMMERCIAL LOAN or INVESTMENT LOAN or SMALL BUSINESS LOAN or ANY TYPE OF LOAN WHAT SO EVER, hire someone like us, who wants to earn your business. I invite you to contact us as we would be happy to assist you with this important transaction. please contact me as I'm more than willing to help. 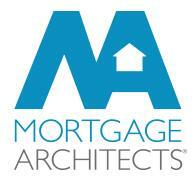 YOUR ONE STOP SHOP FOR ALL YOUR REAL ESTATE & MORTGAGE/LOAN NEEDS !
" EXPERIENCE IS PRICELESS ! " Commercial, Residential & Investments ! BEST Broker! BEST Mortgage! BEST Service! Meet us and understand our unique concept which is very different from other Real Estate & Mortgage Brokerages . (FULL SERVICE BROKERAGE! IN HOUSE COMMERCIAL DIVISION! ) We understand your time is VERY valuable & just to meet us for a brief session and understand the VALUABLE Features, Advantages & Benefits of working with OUR TEAM, we will offer you a COMPLIMENTARY 3 DAYS and 2 NIGHTS HOTEL PACKAGE* ! * The information and opinions contained in this document are obtained from various sources and believed to be reliable, but their accuracy cannot be guaranteed. The publisher assumes no responsibility for errors and omissions, or for damages resulting from using the published information and opinions. This document is provided with the understanding that it does not render legal, accounting, or other professional advice. Whole or partial reproduction is forbidden without the written permission of the publisher.